I'm pretty obsessed with using products that keep my skin clear, and in the process possibly have been over treating my skin with too many blemish fighting products (eek!) As a result my skin has become dry in areas and lacking much needed moisture. Most of the products that I use are gentle and alcohol free but I have not been keeping my skin balanced by putting enough moisture back in, making my skin look dehydrated and adding to my skin woes. 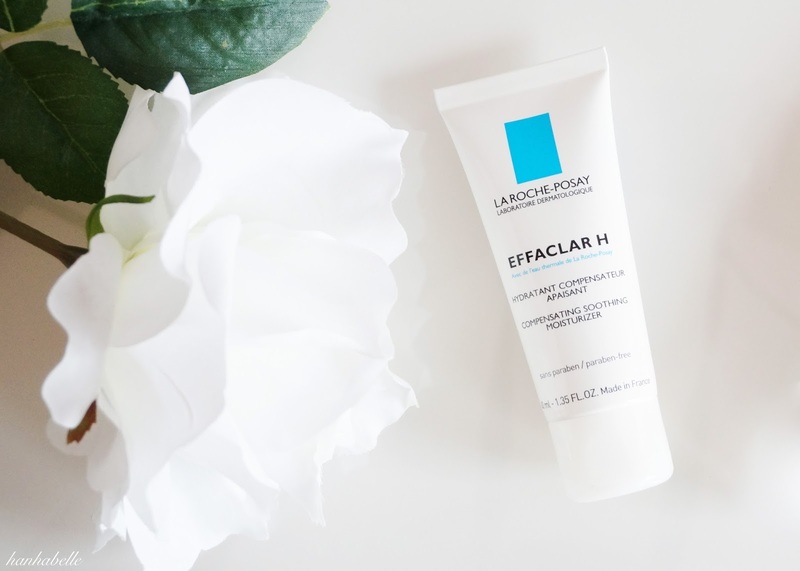 So in addition to using the La Roche Posay Effaclar Duo + on bad skin days, the La Roche Posay Effaclar H Multi-Compensating Soothing Moisturiser* has been a saviour in re balancing my skin and providing it with the essential lipids that it needs. This cream is designed to moisturise oily and combination skin weakened by drying skin care and harsh acne products. It's compensating formulation helps to build up the skin's natural barrier against external aggressions. It also claims to restore comfort and suppleness and soothes irritation with Bisabolo, which is known for it's anti ageing and anti inflammatory properties. Unlike the Efflaclar Duo +, this cream is thicker and creamier but not a runny consistency, containing Cermaide 5 to reinforce the skin's barrier function. The cream feels comfortable on my skin, easy to blend and sinks in without any greasiness. I use this in the mornings and it leaves a nice lightweight protective barrier, not an greasy residue. I have not experienced any sudden breakouts or blocked up pores since using this moisturiser, instead feel reassured to bring the much needed moisture back into my skin, after over treating it with various products. No matter how oily your skin is, your skin still needs nourishment and hydration. Your skin will look more plump and healthy, rather than taut and dry. I feel like this has been the missing step from my skincare routine, as I always struggle to find a moisturiser that protects and nourishes my combination skin. My skin no longer feels dry in areas but much softer to the touch and I'm really pleased with the results only after a few weeks - hallelujah! What moisturiser do you use for your skin? Sounds fab, I haven't tried many other things aside from the effaclar duo, but will give this a go! I know how you feel! I hate it when anti-blemish products dry out your skin too much and you're left w patchy flaky skin. Great review! It's worth a try if you have combination skin! I know what you mean Molly, I was using the effaclar duo constantly but this product is great when your skin calms down a bit and you still want it to stay moisturised. Avene seems like a really soothing brand, I'm keen to try out their face masks. That's so annoying, there's always a risk trying out new blemish clearing products but I'm never had any issues with this range. Fingers cross you find something that works for you! will definitely try out this moisturizer! sounds like it works wonders!